INTRODUCTION: The purpose of this study is to evaluate the validity of a free-access software package (ITK-SNAP) in segmenting and measuring the volume of upper airway spaces secondary to rapid maxillary expansion (RME). MATERIALS AND METHODS: Sixteen participants who required RME were recruited for this study. Preoperative (T1) and 6-month postoperative (T2) cone-beam computed tomographic scans of all participants were analyzed. 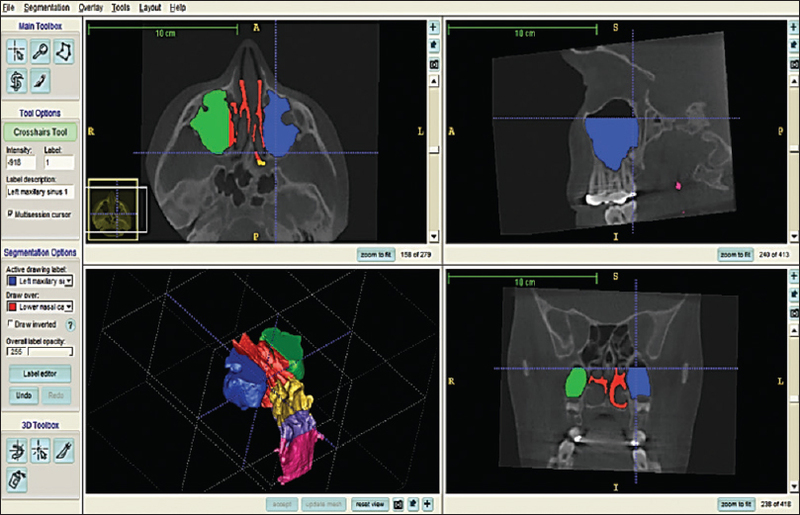 OnDemand3D software packages was used for superimposition and orientation of the images, while ITK-SNAP software was used to measure the volume of airway spaces. At week one (W1), all volumetric measurements were carried out by one examiner and repeated after 1 week (W2). Paired t-test, the interclass correlation coefficient, and Dahlberg coefficients of reliability were used to assess the reproducibility. RESULTS: Student's t-test showed no significant difference between the W1 and W2 set of measurements (P > 0.05). Coefficients of reliability were above 95% and intraclass correlation coefficient ranged from 0.99 to 1.000, which altogether confirmed the satisfactory reproducibility of the measurements. CONCLUSIONS: ITK-SNAP software package is a reliable and cost-effective method to segment and measure upper airway changes subsequent to RME. The effect of rapid maxillary expansion (RME) on the upper airway spaces was first described by Brown, and has subsequently been reported by Haas. These effects can be gauged using nonradiographical objective tests such as Rhinomanometry and Acoustic Rhinometry (AR). The former represents a functional technique that provides a reading of airflow versus differential pressure in order to assess the patency of the nasal cavity. The hindrances of Rhinomanometry are that it necessitates wearing of a mask, while the measurements are being acquired,, inability to localize the site of the obstruction within the nasal passage  as well as unreliability in detecting small changes in nasal patency. On the contrary, AR is based on the concept that changes in the acoustic impedance or the reflection of sound waves within the nasal cavity are proportionate to changes in a cross-sectional area. Potential error might be developed if AR being executed in an environment with a nonstandardized temperature and humidity because sound velocity increases with increase of these variables. Numerous software packages are available to analyze the 3D data acquired from CT or CBCT scan, as part of volumetric measurement process, but all impose a pricey license to operate. Additionally, most of them lack the capability to subdivide the 3D virtual model of airway space, which is a crucial step because each airway segment is associated anatomically and physiologically to a different function and/or disorder. The ultimate aim of the study is to assess the validity of free-access ITK-SNAP software in segmenting and measuring the volumetric changes of upper airways spaces secondary to RME using data derived from CBCT scan. The sample size indicated that 14 participants were required to yield a confidence level of 95% and a Beta error level of 20%. Therefore, it was decided to recruit 17 patients to overcome the potential exclusion of some cases. An ethical approval was granted by NHS/Greater Glasgow/09-S0709/40 and Victoria Hospital/Fife/09-062. A cast-cap appliance with a Hyrax screw (Forestadent, Germany) was used for maxillary expansion. The appliances were activated immediately after capturing the pretreatment CBCT scans (T1). Then, at the end of active phase, a posttreatment scan (T2) was acquired. Both CBCT scans (T1 and T2) were taken using an iCAT scanner (Imaging Sciences International, Hatfield, PA, USA) in natural head position. The data files for the CBCT images have been saved and stored as DICOM files and subsequently analyzed using two different types of analyzing software, namely OnDemand3D (Cybermed, Seoul, Republic of Korea) and ITK-SNAP version 2.2.0 (www.itksnap.org). ITK-SNAP is an open-access popular library image analysis algorithm funded by the US National Library of Medicine. OnDemand3D software package used to superimpose T1 images on their corresponding T2 scans using the anterior cranial bases as stable structures; later, the orientated images were saved as new T1 image (NT1) [Figure 1]. These strategies in orientation permitted a homogeneous segmentation as it excluded potential errors that might be resulted from variable head position. Before commencing the volumetric measurements, a test of the threshold was accomplished through quantifying a volume of a hollow polymer-rubber phantom. The phantom was fully filled with controlled amount of water and the physical volume (PV) was calculated by converting ml to mm 3 (in the ratio 1:1). Afterward, the i-Cat machine scanned the phantom; data imported and examined by ITK-SNAP software wherein the threshold was fine-tuned until the virtual volume match the PV. Accordingly, a threshold of −450 gray levels appeared to be ideal. All volumetric measurements were carried out by one examiner and repeated after 1 week, and the data were exported to a separate datasheet for statistical analysis. Statistical Package for the Social Sciences (version 13; SPSS, Chicago, IL, USA) was used to conduct the statistical analysis. The sample was found to be normally distributed for most parameters using the Kolmogorov–Smirnov test; hence, paired t-tests and intra-class correlation coefficient were used to assess error in the study, while the degree of reproducibility was evaluated using Dahlberg coefficients of reliability. Data of one subject were excluded due to positioning error during CBCT capturing, hence, records of the remaining 16 subjects (8 females and 8 males) were analyzed; mean age was 12.4 and 12.8 years for males and females, respectively [Table 4]. The results of the reproducibility are presented in [Table 5] and [Table 6]. 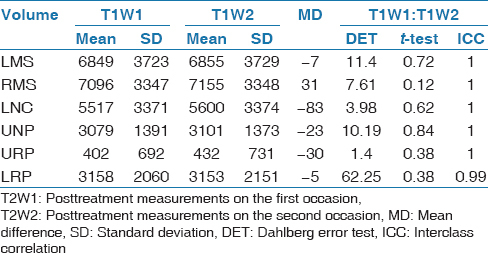 [Table 5], which demonstrates the reproducibility of pretreatment volumetric measurements, shows that there is no statistically significant difference between measurements taken at first week (W1) and the subsequent week (W2) (P > 0.05). The coefficients of reliability are all above 95%, the intra-class correlation coefficient ranged from 0.99 to 1.000. Close examination of the data reveals similarities of the repeated measurement of the volume of left maxillary sinus (LMS) and LRP, with mean difference of 6 and 8 mm 3, respectively. The mean difference of repetitive measurements of the right maxillary sinus (RMS) is nearly six times more than that of LMS, while that for upper nasopharynx (UNP) and URP spaces show a negligible difference, a fluctuation of <1%. The highest dissimilarity is recorded at lower nasal cavity (LNC), 91 mm 3 of an average variation of the mean, though the difference was statistically not significant. Overall, the findings of the repeated posttreatment volumetric measurements at 2 weeks interval shows an almost parallel findings to the repeated pretreatment measurements. A key feature of ITK-SNAP is the existing facilities to segment and navigate through the volumetric data set in three planes of space with a linked cursor system that allows tracking of a single voxel. The automatic segmentation process allows construction of the main 3D virtual surface, while the semi-automatic segmentation allows fine-tuned segmentation to identify the most appropriate border between neighboring structures,, in turn these allow an accurate measurement of the volume of interest. ITK-SNAP software allows subdivision of airway space that, generally, permitted the exclusion of potential masking changes of the adjacent or remote airway spaces. Furthermore, the chosen intensity region filter was set with a reliable threshold value of −450 gray levels. A fixed threshold was adopted rather than interactive one to eliminate operator subjectivity in boundary selection, thus eliminate operator's visual discrimination. 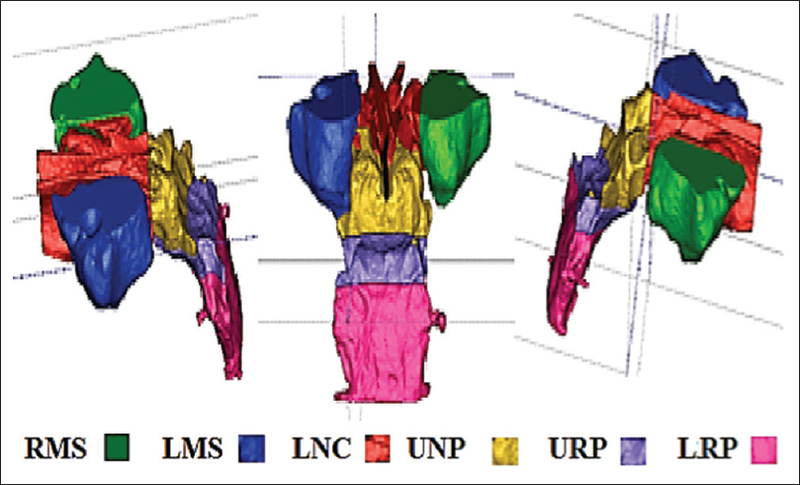 The most acceptable rationalization for high mean difference of the repeated measurements at level of LNC is the semi-automatic segmentation, in particular at area of maxillary sinus's hiatus, which might induce some random errors. Interestingly, it is obvious that volume of interest that is bounded by soft tissue's constructed planes such as UNP and URP exhibited an uppermost degree of difference in the repeated measurements. Nevertheless, all differences were statistically not significant and the reproducibility of the measurements was assessed as being satisfactory. An open-minded criticism of this study is the impossibility of absolute control of the tongue position during radiographic scanning, though the subjects were given special instructions for breathing and swallowing during the 20-second scan of the CBCT capture as recommended by Chang et al. 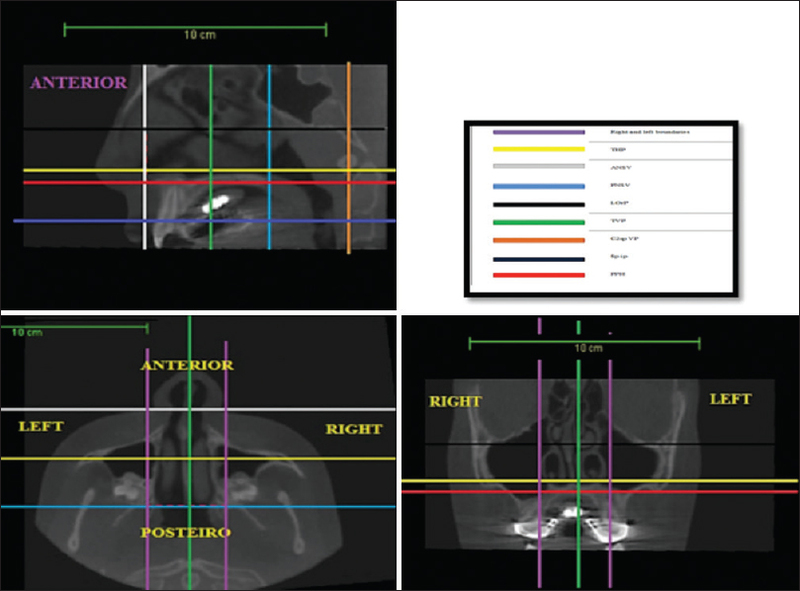 Outcomes of this study confirm that CBCT scanning is a valuable imaging modality to gauge the effect of RME on nasopharyngeal dimensions and ITK-SNAP software is a friendly-use, cost-effective, and reliable package for measuring nasopharyngeal volumes. A second prospective implication of this software package is to measure the dimension of bony defect of patient with cleft palate before alveolar bone grafting. This would assist in quantifying the amount of the required bone to fill the cleft defect and reduce unnecessary morbidity of the donor site as a result of unnecessary over harvesting. A proposal for forthcoming studies includes the usage of a color mapping methodology for detailed appraisal of changes at different parts of the nasopharyngeal space, as shape's alterations of the airway space is as vital as volumetric changes. 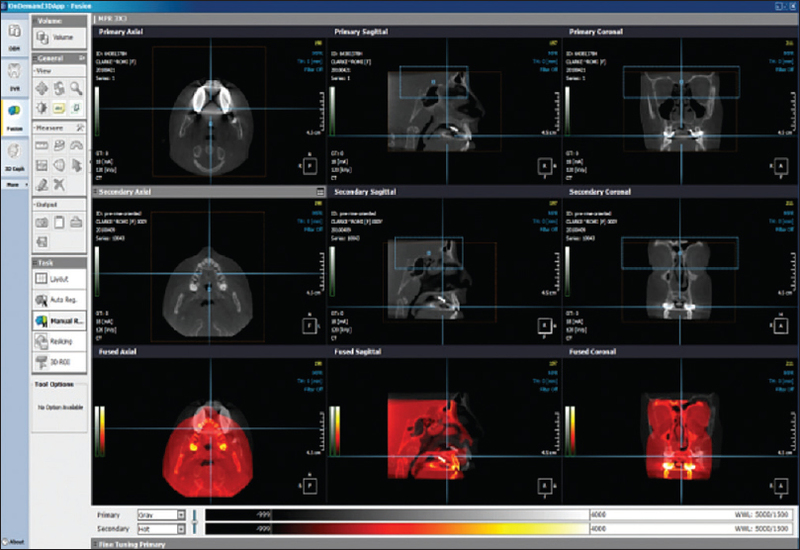 ITK-SNAP software package is a reliable and cost-effective method to segment and measure airway changes subsequent to RME. A single fixed threshold value (−450 gray) is an accurate value for intensity region filtering. Brown G. The application of orthodontia principles to the prevention of nasal disease. Dent Cosmos 1903;45;765-775. Haas AJ. Rapid expansion of the maxillary dental arch and nasal cavity by opening the midpalatal suture. Angle Orthod 1961;31:73-90. Hilberg O, Pedersen O. Acoustic rhinometry: Recommendations for technical specifications and standard operating procedures. Rhinol Suppl 2000;16:3-17. Doruk C, Sökücü O, Biçakçi AA, Yilmaz U, Taş F. Comparison of nasal volume changes during rapid maxillary expansion using acoustic rhinometry and computed tomography. Eur J Orthod 2007;29:251-5. McDonald JP. Airway problems in children-can the orthodontist help? Ann Acad Med Singapore 1995;24:158-62. Lane A, Zweiman B, Lanza D, Swift D, Doty R, Dhong HJ, et al. Acoustic rhinometry in the study of the acute nasal allergic response. Ann Otol Rhinol Laryngol 1996;105:811-8. Wippold FJ. Head and neck imaging: The role of CT and MRI. J Magn Reson Imaging 2007;25:453-65. Kishi K, Nakajima H, Imanishi N. Distally based greater saphenous venoadipofascial-sartorius muscle combined flap with venous anastomosis. Plast Reconstr Surg 2007;119:1808-12.
da Silva Filho OG, do Prado Montes LA, Torelly LF. Rapid maxillary expansion in the deciduous and mixed dentition evaluated through posteroanterior cephalometric analysis. Am J Orthod Dentofacial Orthop 1995;107:268-75. Ahlqvist J, Eliasson S, Welander U. The effect of projection errors on cephalometric length measurements. Eur J Orthod 1986;8:141-8. Baumrind S, Frantz RC. The reliability of head film measurements: 1. Landmark identification. Am J Orthod 1971;60:111-27. Lenza M, Lenza MD, Dalstra M, Melsen B, Cattaneo P. An analysis of different approaches to the assessment of upper airway morphology: A CBCT study. Orthod Craniofac Res 2010;13:96-105. 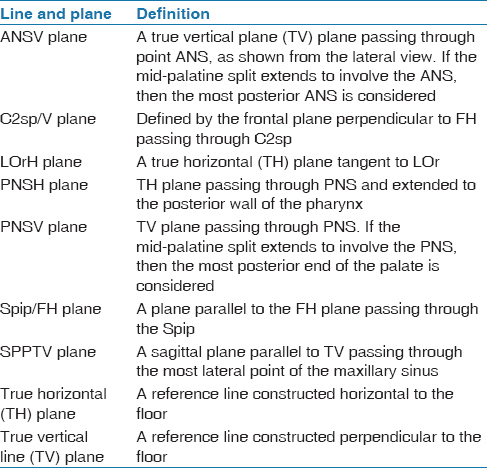 Aboudara C, Nielsen I, Huang JC, Maki K, Miller AJ, Hatcher D. Comparison of airway space with conventional lateral headfilms and 3-dimensional reconstruction from cone-beam computed tomography. Am J Orthod Dentofacial Orthop 2009;135:468-79. Ballanti F, Lione R, Fanucci E, Franchi L, Baccetti T, Cozza P. Immediate and post-retention effects of rapid maxillary expansion investigated by computed tomography in growing patients. Angle Orthod 2009;79:24-9.
da Silva Filho O, Silva Lara T, Malagodi de Almeida A, Cristina da Silva H. Evaluation of the midpalatal suture during rapid palatal expansion in children: A CT study. J Clin Pediatr Dent 2005;29:231-8. Garib DG, Henriques JF, Janson G, Freitas MR, Coelho RA. Rapid maxillary expansion-tooth tissue-borne versus tooth-borne expanders: A computed tomography evaluation of dentoskeletal effects. Angle Orthod 2005;75:548-57. Garrett BJ, Caruso JM, Rungcharassaeng K, Farrage JR, Kim JS, Taylor GD. Skeletal effects to the maxilla after rapid maxillary expansion assessed with cone-beam computed tomography. Am J Orthod Dentofacial Orthop 2008;134:8-9. Lione R, Ballanti F, Franchi L, Baccetti T, Cozza P. Treatment and posttreatment skeletal effects of rapid maxillary expansion studied with low-dose computed tomography in growing subjects. Am J Orthod Dentofacial Orthop 2008;134:389-92. Podesser B, Williams S, Crismani AG, Bantleon HP. Evaluation of the effects of rapid maxillary expansion in growing children using computer tomography scanning: A pilot study. Eur J Orthod 2007;29:37-44. Timms D, Preston C, Daly P. A computed tomographic assessment of maxillary movement induced by rapid expansion-a pilot study. Eur J Orthod 1982;4:123-7. Ong S, Khambay B, McDonald J, Cross D, Brocklebank L, Ju X. The novel use of three-dimensional surface models to quantify and visualise the immediate changes of the mid-facial skeleton following rapid maxillary expansion. Surgeon 2015;13:132-8. Hildebolt CF, Vannier MW, Knapp RH. Validation study of skull three-dimensional computerized tomography measurements. Am J Phys Anthropol 1990;82:283-94. Holberg C, Steinhäuser S, Geis P, Rudzki-Janson I. Cone-beam computed tomography in orthodontics: Benefits and limitations. J Orofac Orthop 2005;66:434-44. Chang Y, Koenig LJ, Pruszynski JE, Bradley TG, Bosio JA, Liu D. Dimensional changes of upper airway after rapid maxillary expansion: A prospective cone-beam computed tomography study. Am J Orthod Dentofacial Orthop 2013;143:462-70. Solow B, Tallgren A. Natural head position in standing subjects. Acta Odontol Scand 1971;29:591-607. Ibanez L, Schroeder W, Ng L, Cates J. The ITK software guide. 2003. Woodside DG, Linder-Aronson S. The channelization of upper and lower anterior face heights compared to population standard in males between ages 6 to 20 years. Eur J Orthod 1979;1:25-40. El H, Palomo JM. Measuring the airway in 3 dimensions: A reliability and accuracy study. Am J Orthod Dentofacial Orthop 2010;137:S50. Weissheimer A, Menezes LM, Sameshima GT, Enciso R, Pham J, Grauer D. Imaging software accuracy for 3-dimensional analysis of the upper airway. Am J Orthod Dentofacial Orthop 2012;142:801-13. Hernández-Alfaro F, Guijarro-Martínez R, Mareque-Bueno J. Effect of mono- and bimaxillary advancement on pharyngeal airway volume: Cone-beam computed tomography evaluation. J Oral Maxillofac Surg 2011;69:395-400.